Color:black AwesomeWare Surround Soundbar supports 3 Wired or Wireless Play Modes Bluetooth Mode: Supports almost all Bluetooth-enabled mobile devices. If there is a call coming in when Bluetooth Mode is on, it will automatically switch to "Call Mode" for hands-free calls with the built-in MIC. Line in Mode: You can enjoy music from the devices connected to the sound bar by an audio cable. TF Card Mode: Plays music files in the TF card. Specifications Power Supply: 5VDC Frequency Response: 100Hz-18KHz Dimensions: 15.7 x 2.2 x 2.4in Weight: 1.3LBS Package Contents 1*AwesomeWare Sound Bar 1*3.5mm Audio Cable 1*RCA Cable 1*Remote Control 1*Charging Cable 1*User Manual Note When battery works below average 3.3V for more than 15 seconds, you will hear the warning tone "power off" and the sound bar for tv will shut down soon. When the LED light is off, the soundbar bluetooth might suggest the battery is run out and you need to charge the sound bar before use. Your TV should support analog output when it is connected with the TV speaker, otherwise you need an audio switcher. Please contact us first if you have any questions. Thanks for your effort to improve our sound bar. 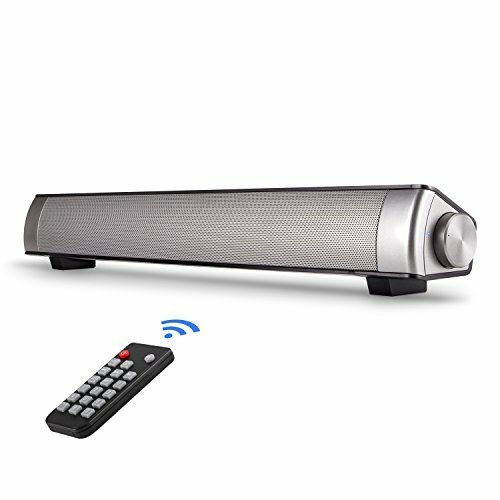 MATCHING VARIOUS SMART DEVICES: With the latest 4.0+EDR wireless Bluetooth tv sound bar speaker, you can enjoy music with one-touch, fitting in Smart TV, cellphone, tablet, laptop and so on. DUAL CONTROL: Dual control methods, remote control is convenient for controlling volume, connected mode and audio operation. While button control is ideal for home theater speakers system and outdoor use. SMALL SIZE WITH BIG POWER: Fashion and portable design suits any home decoration. You can savor your stereo music time everywhere with wireless Bluetooth function and extra TF-Card files. SUPPORT 30 DAYS FULL REFUND GUARANTEE: We promise to give free technical support for each customer. And we guarantee to refund you within 30 days if there were any quality problems with Iyzer tv sound bar speakers. If you have any questions about this product by Iyzer, contact us by completing and submitting the form below. If you are looking for a specif part number, please include it with your message.